Pet Health: Contaminated Pet Food – Deadly Ingredients! 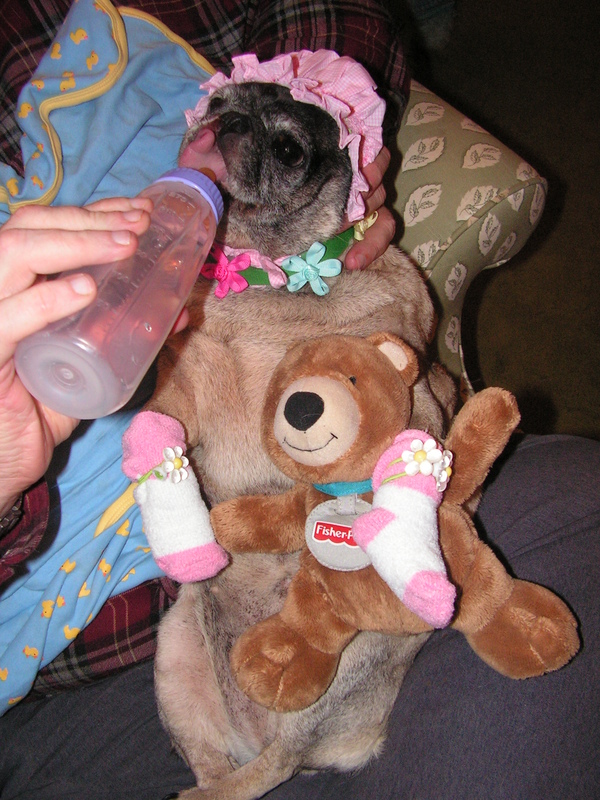 My Pug Gypee, yes I dressed her like a baby! 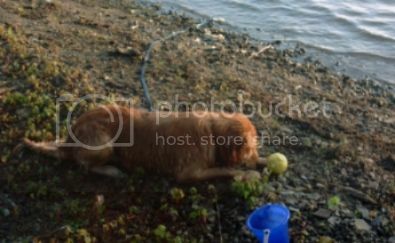 The picture is my Pug, Gypee, who lets me do anything to her! I trained her to drink from a bottle! I hold her in my arms like a baby, and she falls asleep snoring! She is now 15 and blind, but she is still “my baby”. I wrote memoirs about my dogs called My Dogs: A Lifetime of Wonderful Memories. It is posted for your reading. The following post and research was made by Georgann Ryan, who is now with me as a research assistant. Georgann, as with me, is a great lover of dogs and cats. She felt the need to do this research, so you could protect your pets from the poisonous pet food coming from China that is killing and sickening so many pets. I added a “Pet Section” to the this blog and will update it with great information that you can use for the health of your dogs and cats. Dogs like my Audie trust their owners to protect them – so they can focus on what’s really important in life! If you’re concerned about your own health and have pets, you’re probably just as concerned about their health – at least you should be. There’s a lot of information coming out about what’s good and what’s downright harmful for cats and dogs, and being an informed pet parent takes some time and study. Remember the pet food deaths a few years ago and the scandal of pet food with ingredients originating in China? Cats and dogs died by the thousands, and before it was over, the FDA pinned it down to contamination from melamine in the food. Certain Chinese executives actually lost their lives over it. So we don’t have to worry about anything like that happening again, right? Wrong. Thousands of pets, mostly dogs, have again become seriously ill and/or died in the years since 2007 (with over 1,800 reports to the FDA since last October alone). They were fed treats, mostly jerky, which contained chicken originating in China. These treats came from some of the most well known pet food companies and most trusted sources, companies with names that you’d never associate with China like the American Kennel Club. Yes, their jerky treats are on the list. But the list isn’t a list of treats recalled or banned by the FDA, merely a list of suspected treats. Despite the fact that there have been reports of deaths from chicken treats for several years, the FDA still has not placed a recall or ban on a single product because they haven’t determined exactly what is causing the problem with the Chinese chicken used to make these “goodies” and “treats”. And now the problem is starting to expand beyond ingredients other than chicken. I don’t think I’m treating my dog by giving him something so toxic he can die from it. And because the FDA will not intervene to stop the use of Chinese chicken (or other suspect ingredients) in treats until they can determine exactly what is so deadly (despite the fact that they’ve had several years to figure it out), I’ve decided my dog can live without chicken treats of any type, no matter who makes them. “Gregg Bernhardt, owner of Bag of Bones Barkery, a retailer in Hamilton, N.J., prepares a proprietary line of all-natural treats that he sells in his store and wholesales to other pet retailers. He’s noticed a growing demand for exotic and alternative proteins in pets’ treats. “Meats such as kangaroo, ostrich, elk, wild boar, quail, pheasant, rabbit and even goat and llama are coming up more in conversations with our customers,” he said. Petco to Stop Sales of China-Made Dog & Cat Treats To date, Petco is one of the few large retailers that have voluntarily removed all treats with Chinese ingredients from their shelves. 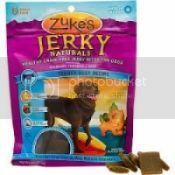 Among the treats they still sell which are listed as absolutely safe with US ingredients are Zukes jerky treats, and I can verify that my dog Audie loves them, as did my last two goldens, Zoe and Bo. They’re so tempting that at therapy dog meetings, other dogs would come over to sniff Zoe’s provision bag looking for them. Nothing else generated a similar response among that group of normally well-behaved canines! Zuke’s Jerky Treats are safe with no Chinese ingredients and an A heavy metals rating – and dogs love them! Dog Food Advisor: Receive email newsletters and alerts You can sign up to receive email newsletters and alerts about dog food recalls to stay informed on this and any other news about all types of dog food. “The agency claims it doesn’t know why the treats are hurting animals, but it admits that they are, and that pet owners need to be cautious. 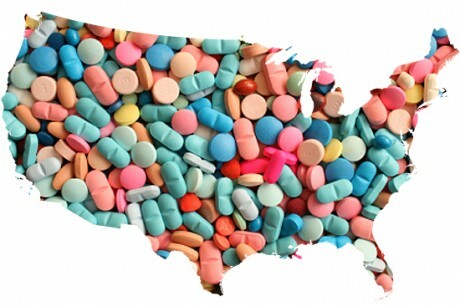 Thousands of illness reports have been submitted to the FDA over the past seven years citing gastrointestinal problems, kidney failure, and other health problems associated with the treats. Since 2007, the agency says it has received complaints about 5,600 dogs, 24 cats, and three people who were harmed by the treats. The agency continues to caution pet owners that jerky treats are not required for a balanced diet and encourage them to consult with their veterinarians, both prior to feeding treats and if they notice symptoms in their pets,” said the FDA in a recent statement. List of Safety Recall Jerky Dog Treats & Pet Chews From China This site contains a list of all pet products actually recalled in 2013, (though mainly by manufacturers rather than the FDA). The truth is, basically, because the FDA can’t determine why the treats are killing dogs, they aren’t doing anything to protect them. But because they know that dogs are dying, they’re asking the public to save the treats and send them in when their dogs have severe or deadly health crises after eating them. They’re also asking that if your dog experiences symptoms of being poisoned after eating treats, that you report it to the FDA’s Consumer Complaint Coordinator. That doesn’t sound like protection to me. And it doesn’t sound like the best way to determine the problem with the Chinese ingredients either. Personally, I’ll skip the treats completely unless the package not only says, “Made in the USA” but also, “Source ingredients are exclusively from the USA”. Let them conduct their “research” on someone else’s dead dog. There are a number of cases of treat death from Fanconi Syndrome, one cause of which is heavy metal poisoning, but the FDA won’t acknowledge this could be a problem or take action. Because of that, veterinarians are pushing the FDA for action as well. A site that rates treats according to the level of heavy metals they contain is linked at the bottom of this post. Treats from China Poisoning Dogs Since 2012, vets have been warning that it’s more than just chicken treats which are causing problems. In short, just about any treat which contains Chinese ingredients is suspect. “The brands veterinarians say are associated with the new cases of unexplained acute kidney failure are Canyon Creek Ranch Chicken Yam Good Dog Treats (Nestle-Purina), Beefeaters Sweet Potato Treats (16 types of yam-related treats), Drs. Foster and Smith (exact item not specified in the report) and Dogswell Veggie Life Vitality (4 types of Veggie Life brands). If despite these warnings your pet is given jerky treats and develops any symptoms, take him to the vet immediately and tell the vet what he has eaten. His life could be at stake. China Refuses FDA Jerky Pet Treat Testing This is not a new problem though. 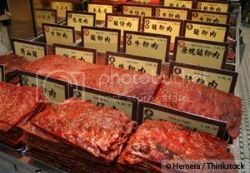 The Chinese government has refused to let inspectors collect samples of the product for analysis. The inspections were conducted in April, 2012 at sites in… China. The treats are sold by Nestle Purina PetCare Co. Given how many pets have died, not just in this outbreak but in the previous one, and given the lack of cooperation by Chinese officials, shouldn’t there be some discussion about banning all pet products or ingredients used in pet foods and treats coming from China? But instead of that, the Obama administration recently lifted the ban on Chinese chicken being sold to people in supermarkets within the US. “According to the USDA report, the audit that took place in March found China’s chicken plants were up to the same processing standard as those in United States, which means that the products are “safe, wholesome, unadulterated, and properly labeled.” However, no USDA inspectors will be present in the Chinese processing plants, which means American consumers are not guaranteed that their chicken is being slaughtered in safe and sanitary conditions. China has an infamous reputation as one of the world’s worst food safety offenders. Earlier this year, the U.S. Food and Drug Administration (FDA) released a report on a Chinese chicken jerky manufacturer that created dog treats tied to more than 500 dogs’ deaths. The treats were later recalled and blamed for 2,500 animal illnesses. The FDA later found falsified documents, mislabels, and import shortcuts. The Latest On Chicken Jerky Pet Treats From China While the FDA makes excuses and allows more pets to die without taking official action, the problem with Chinese foodstuffs is so well known that Chinese owners actually are paying to import food for their cats and dogs from the US. “When Maria Higginbotham couldn’t find the usual dog treats she buys at her local Target store back in early January, she decided to instead buy some brand-name chicken jerky dog treats for Bandit, her 3-year-old rat terrier. Four days later, Bandit collapsed on the floor. He was soon experiencing bloody diarrhea, and by the time Higginbotham and her mother got him to his veterinarian, his organs were shutting down. His liver showed that he had eaten something toxic. Certain that Bandit’s inexplicable illness had already become too severe, the veterinarian suggested putting him down, and Higginbotham’s mother and son agreed. With stories such as this happening all over the country, it’s understandable that owners are becoming increasingly angry. But instead of banning the cause, Chinese ingredients, the treats listed above which were removed from store shelves after the FDA warning are once again appearing for sale. “By federal law, a government agency is required to fulfill a Freedom of Information Act request within 20 business days. FDA acknowledged receipt of this request on November 4, 2013 (Confirmation # FDA1307738) – to date, FDA has not responded. Urge the FDA to Ban Dog Treat Imports Until They Are Safe To Consume Another thing you can do is to sign this petition to the FDA asking that Chinese ingredients be banned from pet foods. The bottom line is, If you love your dog, stay away from treats of any kind unless the package clearly says that ALL INGREDIENTS ORIGINATE IN THE USA. If you’re uncertain about a particular brand, don’t buy them. And find out where the meat you’re purchasing for yourself originates. It’s not only Chinese chicken in pet treats that’s dangerous. As an alternative, you can make your own chicken treats and biscuits at home, so you can be sure that what your pet is getting isn’t toxic. There are lots of recipes available on the internet. Just google “homemade dog/cat treats” or “dehydrate chicken for dog treats”. But remember not to give pets cooked chicken bones because they easily splinter and can puncture your pets stomach, resulting in a painful, protracted death. The following two short, humorous videos address the deception used in advertising which is geared toward both pets and their owners. But the points they make aren’t funny. There is an agenda to promote dangerous foods for humans and animals through outright deception and use of the word “Natural”, and it’s permitted by the FDA. Are you aware of GMO foods (genetically modified organisms) and what they can do not only to your health, but to your pets’ health? Did you know that most pet foods, even premium brands, have corn or wheat as their primary ingredient? That fact alone is bad enough since cats, even more than dogs, are carnivores which means that grains and vegetables are not a normal part of their diet when they eat in the wild. Their systems aren’t designed to digest vast amounts of grain/vegetable matter, and the nutrients necessary to keep them healthy aren’t available from vegetables and grains. So they’re slowly being starved of vital nutrients when you purchase food with these as the primary ingredients, and that leads to a breakdown of their immune systems, general weakness and health problems. Notice how many pets today have allergies or fungal problems like infected ears and paws so that they’re constantly scratching or licking? That is a direct result of diet. And the remedy most vets prescribe are steroids, which only weaken immune systems further. More effective is a change of diet to a food without grain and anti-fungal drops or prescription medications such as the anti-fungal drug, Itraconazole. A few days treatment with this drug ended my dogs’ chronic ear problems permanently. But the problem is even worse than described above because corn is the most used ingredient in virtually every pet food available at grocery stores. And almost all corn (except organically grown, which never is used in commercial pet food because of its cost) is genetically modified. Rats given GMO corn will eat it only when they are at the point of starvation. What do they know that people don’t? Yet our pets consume vast quantities of it because again, that’s what they’re fed by owners. Like the lab rats, they have no choice except to eat it or starve. But grain-free pet foods are becoming increasingly available at pet stores, farm stores, etc. I’ve even found it (though only a single bag) at my local Walmart. It is more expensive than generic or popular brands, but not much more than premium pet foods. And the savings in vet bills due to better health more than offsets the cost of the food. Just look for the words “grain free” on the bag. Soy: One Protein Dog and Cat Owners Should Steer Clear Of This article also warns consumers to watch for and avoid soy protein in their pets’ food. Pet Foods Heavy Metals Ratings This site tests and rates pet foods and treats according to the levels of toxic heavy metals they contain. Because GMO’s and contamination aren’t the only problems to be aware of, this site provides further information on dangerous ingredients or lack of them in popular pet foods and treats. All of this concern for pets and what they’re eating should raise alarms for people about their own diets as well, especially if you’ve read the article about the administration opting to allow Chinese chicken to reach American consumers. There are more articles and videos about GMO foods that are being permitted in the country’s food supply than can be listed. Just google the topic, “GMO foods” to find enough to make you want to quit eating altogether. GMOs have been banned for use in human food in Europe. But the primary producer of GMO patents is Monsanto, a US corporation, so the American government continues to insist that they’re safe. We’ll address this topic of how pervasive the problem has become and how much deception is involved in the production and sale of food in some depth in future posts. God’s Word requires us to care for our pets and for those animals in our charge, and He will hold us accountable for how we treat them. They are a part of the creation that, along with us, is longing for redemption. The new earth will be filled with animals and Scripture seems to indicate that the pets we cherish will be reunited with us in heaven. 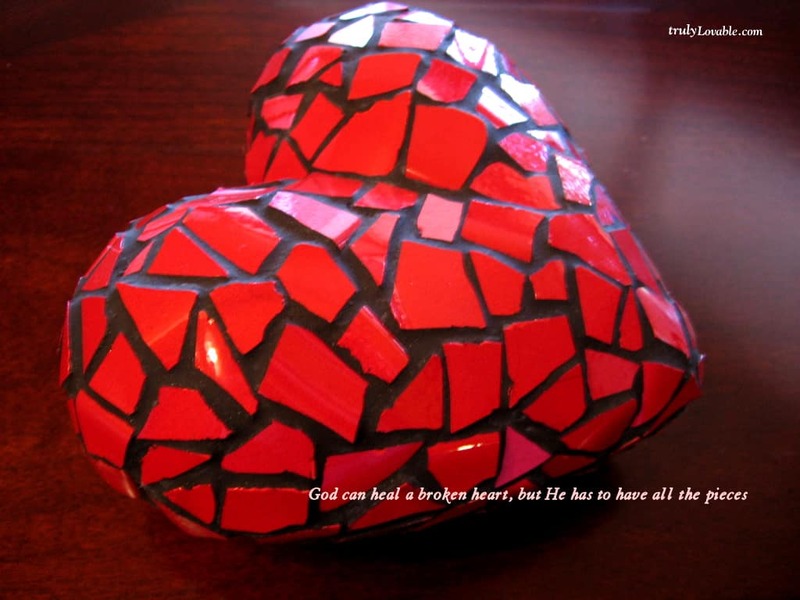 That’s compelling evidence of how much they matter to God and are loved by Him. For that reason, along with the knowledge of how much they add to our lives through their loyal, loving and trusting natures, they should matter to us! It’s both our duty and our privilege to do the best we can for them because of the God-given dominion we hold over them. Excellent article! I realize this is a few years old, but still completely relevant. I wanted to add a few more notes of interest- treats are not the only things responsible for pet deaths, remember the major pet food recalls in 2007? Melamine was discovered in several brands of pet food which resulted in the deaths of thousands of pets nationwide. Beyond this issue, the “meat” used in pet food (I use the term lightly because typically there is minimal if any muscle meat protein, with skin, feathers and bones being used instead) come from non-human grade meat of dead, disabled, diseased, and dying animals (called 4D). 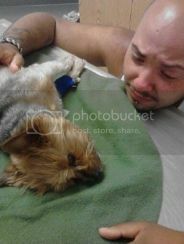 These are sick animals that have been pumped full of Rx meds in an attempt to get them healthy enough for human consumption (which brings more money) and when they get too sick, they are euthanized (sodium pentobarbital, which only concentrates in the kibble manufacture process, see http://truthaboutpetfood.com/pentobarbital-in-dog-food-never-resolved/) Any meats denied for human consumption must be “denatured”, that is, cut into minute ribbons for maximum surface area before being sprayed with poison (to prevent it being sold or consumed on the blackmarket) before being shipped off to the renderer where it’s made, among other things, into pet food. Also used are animals found dead (usually for several days or weeks) in the field, euthanized zoo animals, and roadkill.To top it off, the law actually allows for the rendering of euthanized cats and dogs into pet food, and thought pet food companies vehemently deny doing it, findings of the euthanasia drug in certain pet foods may indicate this is actually going on. Bottom line, there are minimal regulations on pet food, which is basically a dumping ground for poisons and garbage that will make your pets sick. IMO it’s ALL poison. Lets go back to how pets were ALWAYS fed before the 1950s, with fresh, real foods and meaty bones- that’s how I’ve been feeding my dogs and cats for the past 10yrs and they’ve never been healthier! All good points. While I haven’t gone the raw food route (with far too many cats to feed, most of whom I’d like to place in good homes) I have switched to grain free food for them, and the cats’ health has made a substantial improvement; virtually no illness any longer. 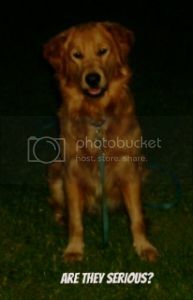 I’ve fed my one spoiled golden retriever grain-free since he was a puppy and he’s a strong, healthy dog. So you’re right about healthy food being the most important thing we can do for our pets. And it’s scandalous how they use euthanized pets (including flea collars and all) in many commercial foods. Thanks for mentioning that – I’ll be sure to post info on it in upcoming health blogs. See also our update post on this original article: http://godshealthsystem.com/blog/pet-health-deadly-foods-update-and-cardboard-box-cats/ and the Pet Health section in our most recent post, http://godshealthsystem.com/blog/foods-coming-from-china-filled-with-plastics-pesticides-and-hazards/ There’s an article and a link there for “Dog Food Advisor” where over 4,500 foods are given detailed analysis, with specific info on the companies producing it, recalls, and nutrition information, GMOs, etc. It’s a great site for anyone interested in pet foods which are good versus awful. I hope you’ll subscribe to God’s Health System; there’s usually an article or two in every post on pet health. Thanks for the kind reply, I’ll be sure to check out the links, I certainly appreciate it! I’m happy to say I’m already a subscriber to the newsletters and am very impressed with the info I’ve learned so far, thanks for the awesome site! 🙂 God bless! Next story Vitamin D3 vs Vitamin D2: Are You Getting the Right One?